For Christmas, I received an ESV Journaling Bible: one of those now-popular Bibles with extra margin room for notes and illustrations. I’ve been admiring all the Bible-margin artwork popping up on the Internet these days, and wondering what it would be like as a method of meditating on a passage. I’ve especially wondered if I could merge that ruminative artistic thinking with the kind of word-analysis and notes I’ve enjoyed for a long time (as I shared in this post), and which is also rather visual. I did find some examples along these lines, and especially enjoyed the work of Sara of Sara Laughed and Valerie Sjodin. 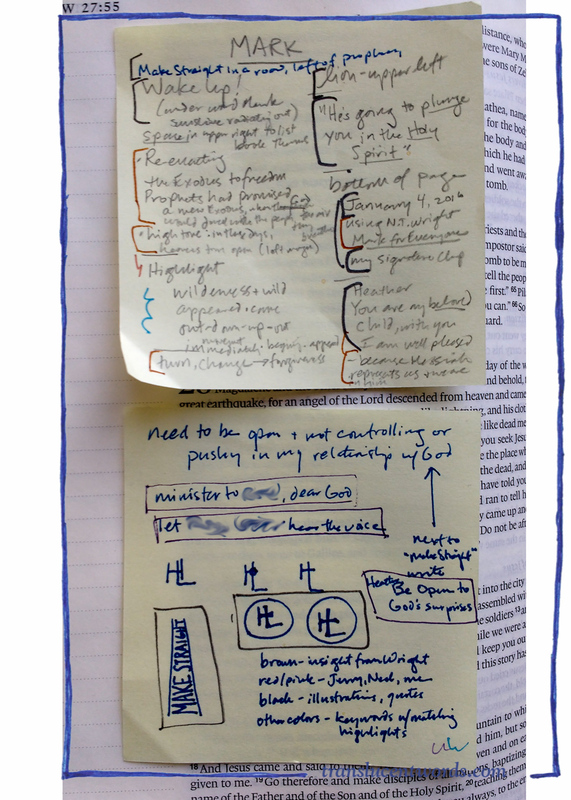 But when a brand new Bible with large, empty margins was staring up at me, I found I needed to plan out my process. What was I going to do first? How would I get started each day, and yet avoid just making a mess? So, if you have been looking at a new Bible of your own–or just considering your devotional process–read on. I’m going to describe the initial process I came up with. It’s brand new, and hardly perfect, but I find reading other people’s step-by-step methods amazingly helpful, so I’m going to offer this as a starting point. Last year I used a Bible-in-a-Year Plan, which was great for perspective, but left me craving some slow, meditative reading. 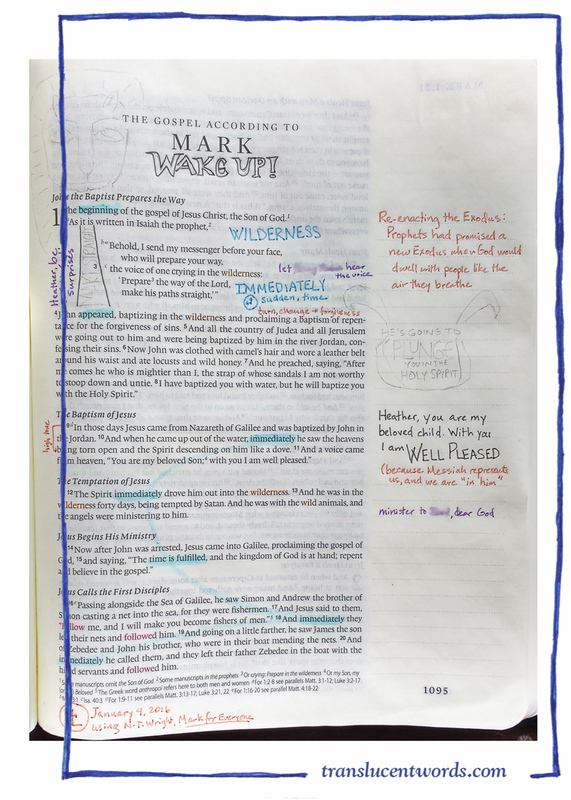 So I mapped out the book of Mark with lots of margin: a chapter a week or less. I planned to read the whole section each day, and do one or more of the steps below. On the first day (Sunday), I just read the passage, trying to imagine and experience. My brain wanted to leap into analysis or creation but I tried my best to rein it back and be still! I’ve come to really enjoy commentaries, and the different ideas they offer. This time I kept it very simple, and just read the relevant sections of N. T. Wright’s Mark for Everyone. I decided to write insights from this book in brown ink. I also liked his translation with the word “plunge,” and suggestion of hearing your own name in the passage: those became part of the word-art, which is penciled or in black below. I took one morning just to pray about how this related to my life and the people I know. 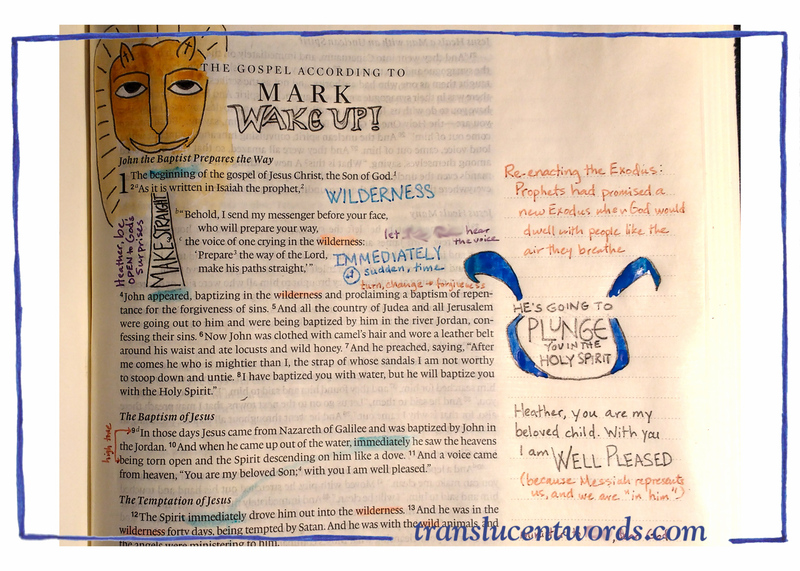 Lisa Nichols Hickman’s book, Writing in the Margins, had suggested praying for others right in the pages of your Bible, and I was eager to try it. I chose the purple pen color for these personal notes (names are blurred out in the photos). You can see my faltering first attempts at illustration in the photos! It was great fun both to plan and to paint these little images. Mark was traditionally represented as a lion in medieval manuscripts, and he seems to start with a roar on this fast-paced, “immediately”-strewn page, so I drew a lion based on Ethiopian folk-art. 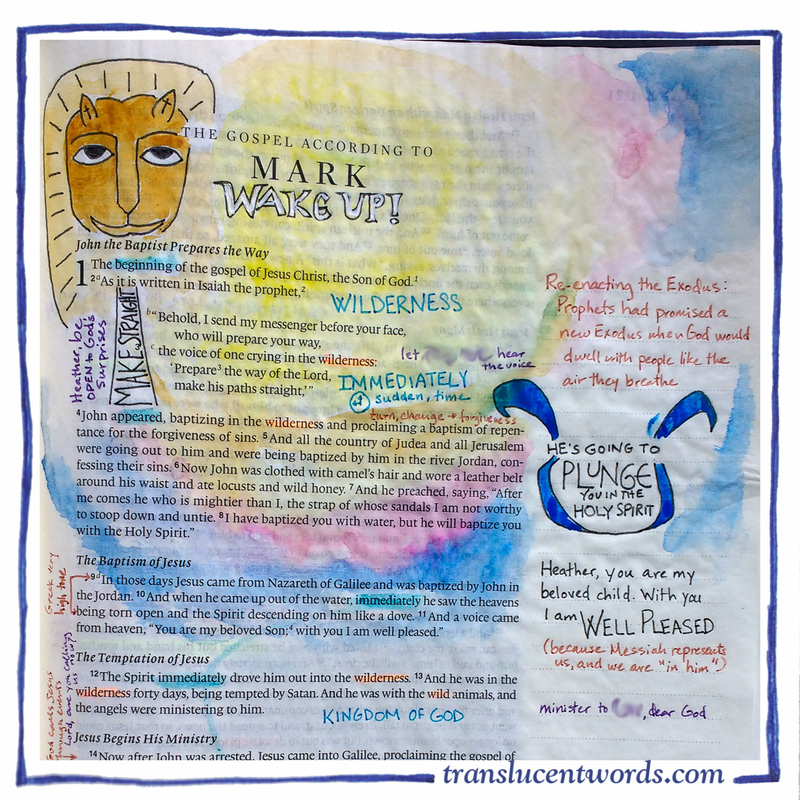 The idea that baptism in the Jordan was meant to wake echos of the Exodus made me think of a sculpture I’d seen of the Exodus, and the curling water changed as I sketched, reflecting the word “plunge.” WAKE UP, and the radiating colors of dawn, were just an attempt to capture the energy of the text—and the colors do liven up the page. I used Neocolor II watercolor crayons (thank you, Lindsay and Luke! ), which worked beautifully…though as you can see, the waterbrush I used for the dawn colors made things too wet, and my page ended up very wrinkled despite the primer coat of acrylic medium I had used. I have continued to look at this page and consider it, even as I have moved on this week to a new passage. I do recommend this as a way to engage deeply with the text. So that is my process for now. Leave a comment and tell me about your process for Bible Journaling or anything else this reminds you of!